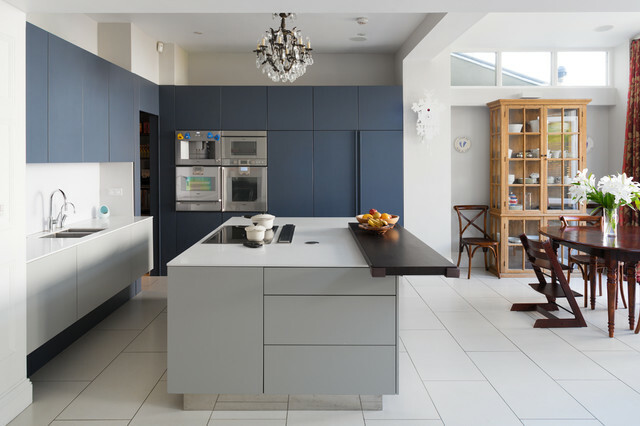 Blue Cabintery: - Can you please tell me the material and colour of the blue cabinetry? Advantages of mattThe main advantage of matt-finish cabinet fronts is the fact that fingerprints, scratches and other imperfections are far less noticeable than on gloss-finish fronts. This doesn’t mean that there are no fingerprints or marks that show, it just means that you don’t see them as much due to the lack of light reflecting on the surface.The colour of matt-finish cabinets can look more consistent than gloss ones. This is because there is no reflection of light to make some areas of the cabinet fronts look brighter or darker than others. Notice how the colours in the kitchen pictured here look far more consistent than those in the red and black gloss kitchen above. Lucy Searle added this to Kitchen Conundrum: Gloss or Matt Kitchen Cabinets? Matt two-tone unitsCompare this open-plan kitchen with the next one – both have similar colour schemes, but this room has matt cabinetry and the following one has gloss. Why matt here? The clue is in the furniture and lighting – both are period-style, which flatters a subtler matt finish more than the glitzier-looking gloss. Use dab of orange/yellow color seen here on opposite wall (where sofa is) or a more burgundy/re/orange?